Below are the most popular calipers found on TCE brake kits. One of the benefits to the TCE kit is the ability to substitute many of these calipers for one another- this being the flexibility of our products. Base kits are designed to meet the needs of most customers, but there are a number of alternatives and upgrades to choose from. Caliper selection can also be altered to meet the customers demands for use such as Road Racing, or Drag Racing where thermal demands or weight loss may be a goal. Many of the calipers below can be ordered with custom applied finishes direct from Wilwood. These finishes include up to 24 colors and 5 logo colors. These take about 3 weeks and are done from bare bodies prior to assembly to assure the finest finish. Click the image for the options. A number of calipers can be had fully polished also. Red and Black finish areis generally in stock for both TCE and drop ship orders. TCE offers all Wilwood calipers for sale individually at competitive prices. For more info please visit the Wilwood Caliper Page directly. TX6R: The Tactical Xtreme TX6R radial mount six-piston calipers are engineered and purpose built for severe duty service on heavy duty Trucks, SUV's, and Class 1, 2, and 3 Armored Vehicles up to 14,000 lbs. GVWR. The combination of the forged aluminum body, stainless steel pistons, large pad volume, and the ability to accommodate brake rotors up to 1.50” thick, make the TX6R the ultimate choice for high strength, lightweight, and tactical level braking capacity for all types of highway and off-road extreme duty service applications. TX6R calipers have a hard anodized finish on base models with options for gloss black or red powder coat and are fit with dirt wipes for improved long lasting service. These new calipers will be the basis for a number of current and yet-to-be-released truck kits very soon! Available in clear anodized finish for builders looking to do their own custom powder coated finish. Finish: Type 3 Grey anodized, BLACK and RED powder coat. TC6r. Used on many Wilwood Truck kits and TCE 16" kits such as Impala SS and Magnum/Charger. Differential bore design and very massive. Caliper measures just over 13" tall. This monster fits rotors from 15" to 16" in diameter yet retains a modest body overhang for maximum wheel clearance. Available in standard Black or optional Red finish. Pad options limited to street and enthusiast compounds. Finish: BLACK and RED powder coat. AERO6: New for 2014 this caliper is an extension of the popular W series caliper. Improvements include; a resculpted body better suited for use on 15" rotors and an all new forged bridge for improved caliper stiffness and rigidity. The Aero series caliper remain a direct fit for all future and former W series applications and come in both a variety of piston sizes and finishes. An added bonus is the internal cross-over feed preventing possible damages to external tubes and providing a much cleaner appearance. AERO4: New for 2014 this caliper is an extension of the popular W series caliper. Improvements include; a resculpted body better suited for use on 15" rotors and an all new forged bridge for improved caliper stiffness and rigidity. 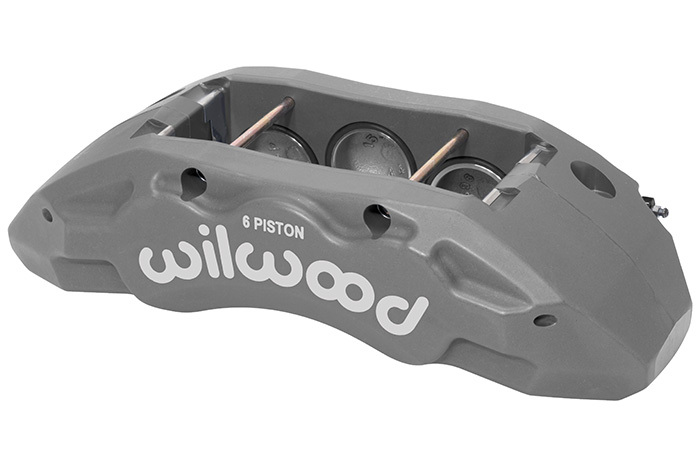 The Aero series caliper remain a direct fit for all future and former W series applications and come in both a variety of piston sizes and finishes. An added bonus is the internal cross-over feed preventing possible damages to external tubes and providing a much cleaner appearance. These calipers have been replaced by the new Aero6 and Aero4 models above. Both share the same pads and mount centers and are fully interchangeable. Forged Superlite 6 for 14" discs. New for 2014 the FSL6 replaces the former BSL6R as the new standard for full sized, radial mount six piston calipers in this class size. Effectively a wide body version of the FNSL6 below this caliper uses the fatter 20mm, 7420 pad for longer life. Currently this caliper is offered in only Quicksilver finish. Available with both SS and Thermlock pistons for added thermal protection. Can be fit to older BSL6 applications. Finish: Type 3 Grey anodized. Forged SuperLite 4 for 14" discs. New for 2014 the FSL4 replaces the former BSL4R as the new standard for full sized, radial mount four piston calipers in this class size. Effectively a wide body version of the FNSL4 below this caliper uses the fatter 20mm, 7420 pad for longer life. Currently this caliper is offered in only Quicksilver finish. Available with both SS and Thermlock pistons for added thermal protection. Can be fit to older BSL4 applications. Forged Narrow Superlite 6 for 14" discs. (FNSL6r) The FNSL6r is the most popular caliper found on both Wilwood factory kits and some TCE 14" kits due to its balance of body size and pad options. This caliper can be had in factory applied Red finish as well as others by custom order. Fit with a narrow pad of .65" the FNSL6r offers maximum wheel clearance. This caliper is a 2012 redesign and update of the former BSL6r and is a direct cross-over fit for those applications. Forged Narrow SuperLite 4 for 14" discs. (FNSL4r) The FNSL4r is based on the six pot body but with four piston configuration. It's the only caliper in this family to come fully dust booted. It's also available with stainless steel pistons for higher heat applications by special order. FNSL4r calipers are non differential bore, use the same .65" pad as the six and have a slightly larger body width. Available in variety of piston sizes for both front and rear use. This caliper is a 2012 update and redesign of the former BSL4r and is a direct cross-over fit for those applications. Forged Billet SuperLite. (FSLi) The staple and work horse of all TCE value packed kits. The FSL is based on years of competition use in its class size. Based on a popular 3.5" mount centers the FSL is both cost effective and versatile. This caliper is the easiest to offer custom colors on and retain the factory Wilwood logo. Pads for the FSL are the very common .80" 7420 plate and can be had in dozens of compounds from various manufactures. Finish: Type 3 Grey anodized. Optional poweder coat: this is the best option for custom colors! Dyna Pro Radial. 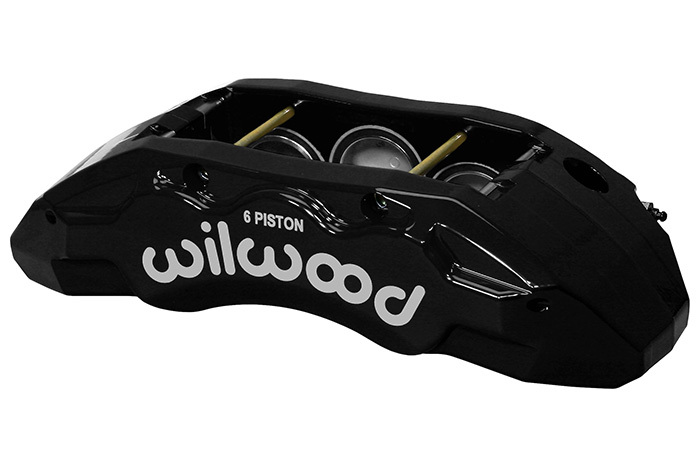 (DPr) The Wilwood DP caliper is a very popular "mid size" caliper with full size performance. The Dyna Pro is also one of the few dust booted calipers in the line. Quick release pad retainers make pad swaps a breeze. The DP is a radial mount caliper and is found on many popular Wilwood factory front kits. It is a non differential bore caliper and can be had with stainless steel pistons by special order. The DP is also readily available in factory applied Red finish. Maximum rotor size is 12.2" and uses a .60" thick pad with a modest choice of compounds available. Finish: Type 3 Grey anodized or optional powder coat. Dyna Pro Six. (DP6) New for 2008! The DP6 offers true differential bore design and is available in three different piston configurations as well as three widths. The low clearance body offers exceptional wheel clearance. This caliper is tab mount incorporating the common 5.25" bolt spread is and is a direct replacement for all Wilwood Dyna Lite applications! With its near 10" long body however it's far larger than the DL caliper and uses a totally new pad that is much longer thus increasing the common short life DL pad use. Finish: BLACK and RED powder coat and Nickel. Narrow Mount Dyna Pro. (NMDP) This new caliper replaces the former NDL caliper for those applications where a 3.5" mount is used but a smaller body caliper is chosen. This caliper is perfect for mid size rotor kits for Drag Racing or AutoX where weight is a key issue. This caliper is also ideal for low clearance fit on many 12.2" kit for 16" wheels and some 13" kits as well. The NDP has a wide range of pad options in .60" thickness. DynaPro Lug Mount. (DPLM) For 2008 the former billet DynaLite line as been revamped and replaced by this new beefier DynaPro model. This caliper comes in a variety of piston sizes, rotor widths and colors. 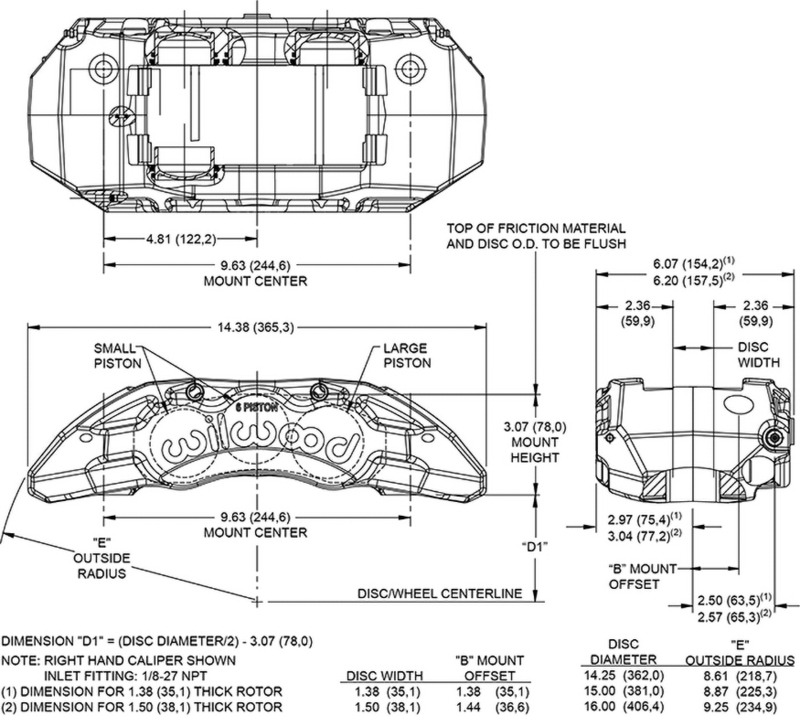 It remains a direct fit for all 5.25" mount former DL applications and the FDL shown below. Popular as the DL has been for many years on light production cars, sports racers and rear kits. Pads remain .49" thick but now sport the popular quick release retention clip. DynaPro Lug Mount-Narrow. (DPLM-N) For 2013 the DPLM line has been expanded to include the 'Narrow' version. This new calipers is narrower in its radial height (nose to heal so to speak) and provides a fit on smaller discs that before could have pad overhand problems. It also is the first and only DPLM that is available in 1.125" bores making it perfect for many rear kit applications! Like the full size caliper pads are .49" thick and use the quick release clip. This pad is not the same as those in the other calipers however and is a different plate currently with more limited pad selection. It may be possible to adapt 7812 pads. Finish: Type 3 Grey anodized, BLACK or RED powder coat. Forged Dynalite. (FDL) The DL caliper is the most popular of calipers found on smaller Wilwood factory kits. It is also used on many smaller racing vehicles such as Sports Racers and Formula cars. The DL can be had in many rotor widths and bore sizes allowing many options for use. This caliper is also available in factory applied Red finish. All DL pads are .49" thick and are available in many compounds from various manufacturers. Finish: Type 3 Grey anodized or optional red powder coat. D8 and D8-6. These calipers are application specific to all C2 and C3 Corvettes. Available in both stock replacement four pot and now optional six pot it is a direct, bolt on replacement for the old iron caliper. Sold in dedicated front and rear kits for proper piston sizing the complete kits include calipers, pads, hardware and stainless steel flex lines. Available in clear, black, red and polished form it's a great improvement to an American Legend. Standard D8 brake pads are retained. Finish: Type 3 Grey anodized or optional RED and BLACK powder coat. Mount: Lug/OE replacement. The D8-6 is a direct fit option for the D8-4 coming from the same body, but with three pistons (staggered) per side. Combo Parking Brake caliper. A caliper to address the needs for a matching rear kits! The P-brake caliper will fit discs up to 14" in diameter and 1.10" wide. The caliper is of single piston floating design yet gives the outward appearance of a multi-piston unit. The lever actuator for the parking brake cable will accept a number of OEM ends and can be customized to fit nearly any use. *Note however that this caliper is not a racing caliper nor a direct substitute for OEM without the need for custom radial mount brackets and proper cables. Available in two piston sizes. DynaPro Single. (DPS) This caliper is an updated version of the former Dynalite single. Available in two piston sizes and two mount centers it's a perfect caliper for many light weight rear applications where weight and space limitations are a concern. Pads are small .490" thick. Selection: Picking the caliper that will best fit your needs can be difficult. Options available on some TCE kits may be an issue to the back side of the wheel spokes. Each of the above calipers has a specific distance from the outboard friction surface to the face of the caliper body. This distance, or body height, can vary by as much as 3/8" and greatly effect spoke clearance. TCE will be glad to help you determine clearance needs. Based on the rotor width used, caliper selected and the hat offsets we can quickly calculate the clearance your design will require.